Hey, don't just take our word for it; see what others have to say about our products! Read a few letters of thanks and browse through a collection of photographs that people have sent us over the years. 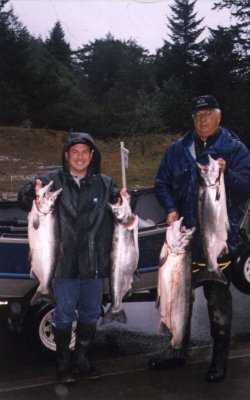 None of these people were paid for their endorsement of our products; they were just happy to let us in on their experience with Sea Wolfe Tackle! I ordered some tackle from you a few weeks ago and had the chance to use it this past saturday. We went out of Rye Harbor to Jeffries, about 32mi out. We caught about 20 haddock, a cusk, and a few dogfish (only 2, thank god) in about 2 1/2 hours before the weather turned nasty and we needed to head back in. Most of the Haddock were about 21", caught a few over 23" that we kept, but we were in 180' of water since the tide was really bad when we tried to fish in 210'. 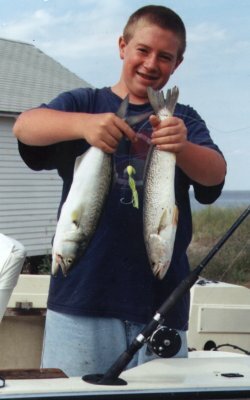 The haddock rigs were great in that we really did catch mostly haddock, which I much prefer catching and eating vs. cod. We used them with clams as bait. I also tried jigging for a bit, but didn't get any hits on the jig. Anyway, I will be ordering some more stuff from you today or tomorrow. Here's a picture of 2 of the Haddocks caught on your rigs. 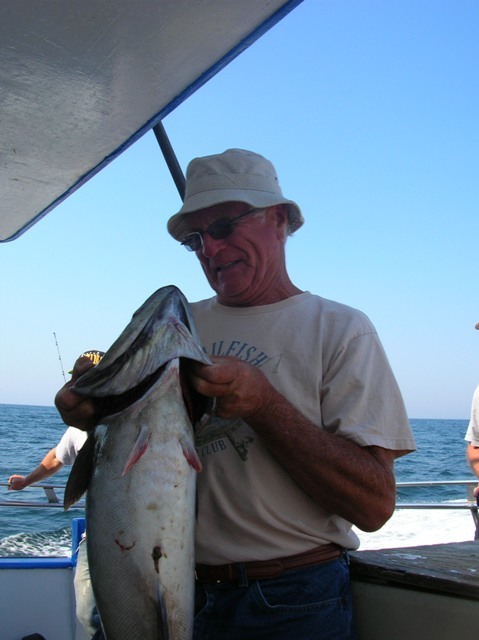 This is Ron Powers pictured in an article in the April, 17 2003 of the New England Fisherman magazine. 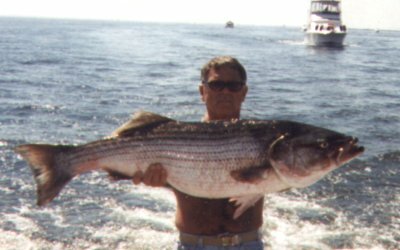 He is shown here with a 20 lb. 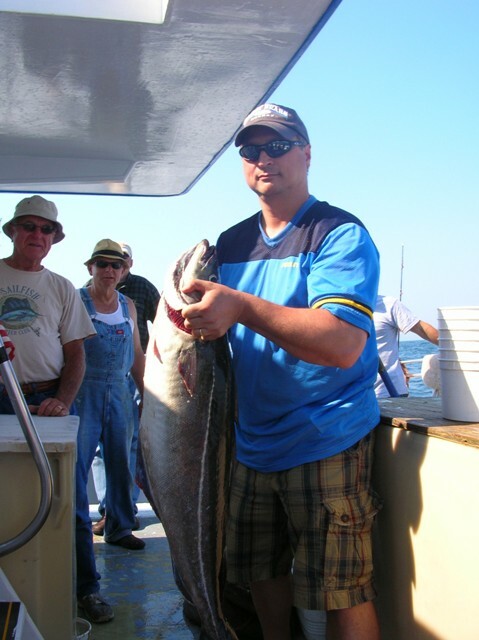 cod that he caught using the SeaWolfe Cod Bomb! Our friend here says: "Anytime anyone considers hooking into big fish, that's only half the battle. Getting them in the boat is the other half. I have found the only way to get there is by releasing the Wolfe!" 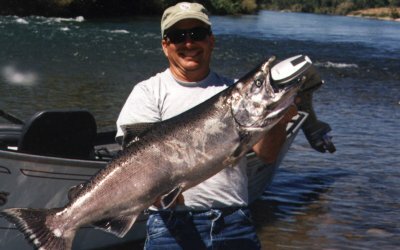 Our friend here wrote: "This is a 40-plus year guide of the Chetco River. (I'm the short guy!) He didn't believe anyone could catch salmon on rubber minnow. Now he believes!" 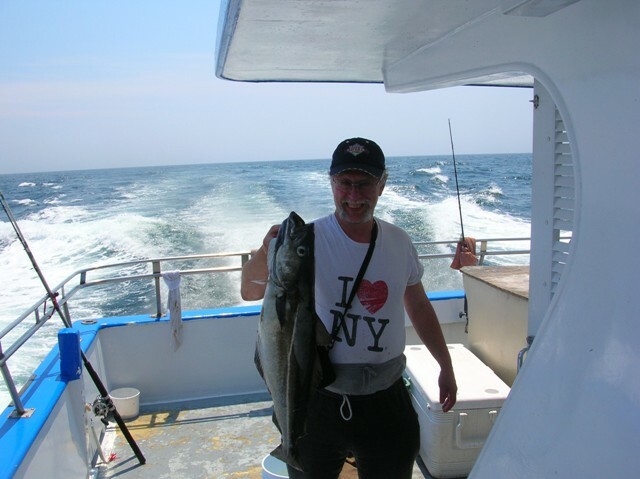 Another customer from New Jersey caught one 12 and one 14 pound bass in Raritan Bay using 02040 dual spinning rig with sandworms for both. Impressive! 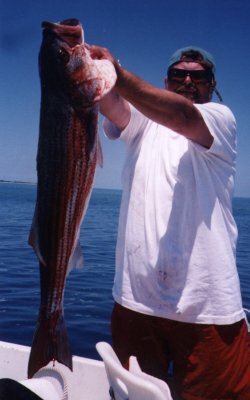 Off Ell point, Nantucket, MA, our island friend caught this beauty while jigging on a wire line. 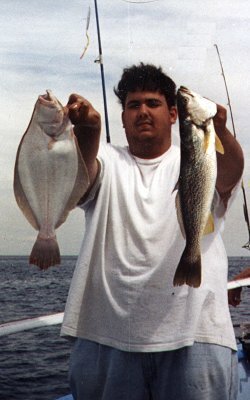 Our buddy from Brooklyn caught the 3 pound fluke on the left and a 4 pound weakfish on the right with a squid/spearing combo bait while drifting a 3/0 sproat hook on a party boat off Long Island. 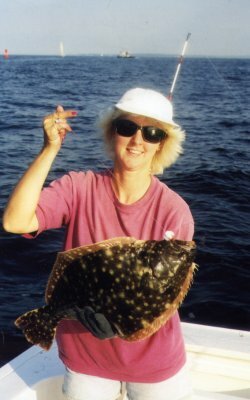 This woman was lucky enough to reel in this 5½-pound fluke while drifting off Stamford CT one summer. Here, you can clearly see the Spin-N-Glo® lure lure on the line. 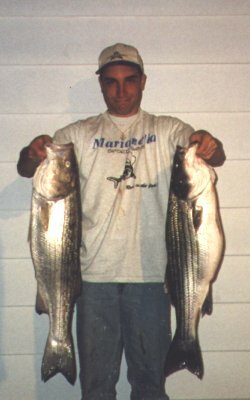 This young man caught these beauties in Delaware Bay using the Spin-N-Glo® Fluke Rig featured prominently between them. More of his success is documented in a letter from his father found in the Customer Letters section.